For instance, researchers and bee breeders have been Breeding Bees for Resistance over the last 15+ years to produce a honeybee which is Varroa Resistant. Other strains are naturally resistant, such as the Russian Stock. This particular strain has been used to create a line of bees which shows good Varroa Resistance. Olympic Wilderness Apiary is a good example of an apiary which has developed mite and disease resistant bees. If some bee strains have developed resistance, then could it not be possible that other bee strains in the wild could have developed a similar resistance naturally? This is an interesting statement. Is it documented? I would like to know if it is hearsay or fact that almost all the feral colonies have died in the UK. Just across the Channel in France, researchers have documented cases of Honey bee colonies that have survived Varroa destructor. Some of these colonies have apparently lived for more than six years while actively combating Varroa. I work mainly with feral swarms…and in my area there has been an upturn in the number of feral swarms over the last 15+ years. My source for this information is from beekeepers in the area, researchers, and a major bee pest control companies here in Colorado. One company I consulted has been operating since the 1970’s and the owners kept honeybees even before that. My point is that we do not really know for certain how many colonies around the world are resistant and how many are not, mainly because we cannot physically access all of the feral colonies around the world. I tend to look at it this way: if you find a feral swarm and you know it came from a wild colony…then there is a good chance this feral swarm has some level of mite resistance. After all, it has survived in the wild for some time without human treatment. I am an advocate of natural cell beekeeping. I don’t think it will either. I am not an advocate of small-cell beekeeping. I am an advocate of natural cell beekeeping. Why not let the bees build their own comb to their own specifications? Typically, natural comb is not an average size. It varies from “large cell” to “small cell.” I know that Varroa can attack in natural cell size as well as in regular foundation cell size. I would rather have my bees combat Varroa in the cell size of their of making, rather than one I have forced on them be it natural or small-cell. Those are my thoughts on varroa mites. I am currently looking into Essential Oils for Mite Control to reduce mite loads and combat disease in the hive. I will post my findings here on this blog. Thanks for reading! I value all input and comments. Discussion makes the world a more interesting place. This entry was posted in Sustainable Beekeeping, Thoughts on Beekeeping and tagged bee disease, beehive, natural cell beekeeping, Varroa Mites, Wild Honeybees. Bookmark the permalink. I am really enjoying the discussions on this website! How refreshing to hear from beekeepers who don’t come off as though their opinion is the only one that matters. You people are the types that I would enjoy meeting and forming an association. Great insight without preaching – thanks! beemee – Hi beemee! I agree with you. It is important to remember that every beekeeper looks at beekeeping differently. Each beekeeper must make their own decisions about how to keep their bees. BTW, I personally believe that every beekeeper has something to bring to the table. The more we discuss, the more we can learn from each other. it seems that medicating bees just continues genetic lines of bees that have the least resistance to mites and disease. it seems that refusing to medicate our bees might help more resistance strains emerge. I am grateful for all the time & effort put into this site. 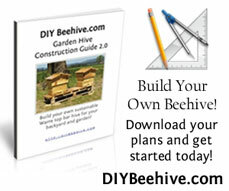 The Warre hive plans are so detailed and easy to follow. Thank you! I will be trying out 2 hives with Warre this season; I was leaning to KTBH’s but am liking the verticality of the Warre – so you were instrumental as there is limited info on Warre out there to help me make this decision. Marika – Wow, thank you for your kind comments! Very thoughtful. At this moment i have 1 Lang going I used to have up to 50 hives wen i was younger. Now living in town i have 1 in the yard. I also have Long Hive that is MT, I am looking 4 a swarm. However said that I am fighting the mites in my lone lang so i will go back to the Apstian strip for a bit. I have never had a Warrre Hive an am just reading on it. As i live in the upper Midwest US ,I need to be concerned for winter over also. I am very much of a proponent of using Terramycin in a spring feeding where the beez will make comb from the surip, Reason is when YOUNG i knew a fellow who ran into fowl brood an it wasn’t a nice sight. Had to burn everything. These are some thought to consider . Bill – Thanks for your comments! I don’t mean to be controversial, but I don’t like Terramycin at all. Very harsh stuff, especially on the bees. I am not at all convinced of its necessity. I don’t use it, and I have not had an issue with foulbrood at all. Many of my beekeeper friends don’t use it either. Not to say that you are wrong for using Terramycin, but I don’t see any reason to put chemicals into the beehive in an attempt to prevent a disease which you are not sure your beehive even has. I just finished reading “A World Without Bees” and got the whole life before Varroa and life after Varroa reality. It’s a scary situation for bees. But I really appreciate your optimism and curiosity. And I agree about medication being a culprit to some weaknesses in bee colonies. The other thing I am interested in (as well as your catching wild swarms and potential inherent resistances) is genetic diversity. Most of the bees available for purchase here in Seattle come from one distributor, and I worry that that limits the bees response to environmental factors. Last year I acquired some Carniolans from another provider, and I am so happy how much better suited to our winters they are. But I have read a lot lately about the new Minnesota bee that is mite resistant to some extent (or totally? ), which is interesting and perhaps auspicious, but potentially just another condition. Letting bees do their thing, like swarm, is really one of the only ways out of this fiasco I beleive. Dissolve the granules in very hot (almost boiling) water and let it cool prior to adding the oils into the mixture. Oils evaporate when the water is too hot. The lecithin is an emulsifier and helps disperse the oils in the water mixture. Oils seem to mix better in honey. This is the standard recipe according to a few website articles I have read about using essential oils, and these are the two oils used in the HBH. When the bees are fed HBH, they tranfer it into the brood cells. The V Mites either die from it or their eggs cannot mature properly. I have thought about using this on package bees as a spray since it would cause the mites to fall off the bees (slippery suction pads) and possibly kill them on contact or shortly thereafter. As with any medication, I don’t want to become reliant and over use. This behavior breeds bees that can’t fight it themselves. I do want to give them a running start however. The rest is up to them. Dear Nick, have You or anyone else tried Propane gas treatment against varroa? I was searching what the Russians did against varroa and came accross Dr. Kashkovski’s patented idea of putting Propane gas in the hive. I tried it on a very weak, heavily infected hive and a few days later I saw the bees were flying very vigorously (I had nothing to loose with that hive). Absolutely no damage to the bees and uncapped brood. Today is the fouth day and I treated again, let’s see what happens. Another application offered by Mr. Kashkovski is to shake the bees into a rotating mesh cilinder and raise the temperature to 48C.